A common question from companies interested in creating marketing plans or communications is, “How much will this cost?”. A common question from designers, agencies, web firms, printers and other providers is, “Do you have a marketing budget?”. The reasons are obvious… organizations want to maximize the return and minimize the cost. Providers want to know if the way the project is being described is “realistic”. Here’s an excerpt from Genius! 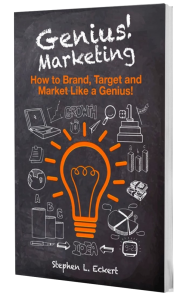 Marketing: How to Brand, Target and Market Like a Genius! (click to buy now!) or watch the video on marketing budget below to learn more. Freedom is Not Free… Neither is Social Media. Neither is PR. That’s a fact. One of the most frustrating things for a marketer is for non-marketers to assume things can be done for free or very low cost. I have been told by companies that they want to use PR or Social Media because “it’s free”. Advertising, conversely, is “expensive”. Learn about marketing budgeting and more in the Genius! Marketing book! If we were to talk for ten minutes while I look at your website, I could place a Google search ad for your business in less than an hour. I could write, produce and place a radio ad for your business in three hours. There would be a cost to the media – setting a budget with Google and a cost to the radio airtime. Each would show up as an invoice or charge on your credit card at the end of the month. That’s a marketing tactic that “costs” or is “expensive”. To place a PR story with a local publication or media outlet, I’d need to understand your company, talking to management or key players about the subject of the news release and possibly need to have a photograph shot (some news outlets require a photo with releases). Together, we would develop a news release and list of subjects for media consideration. The news release would be distributed electronically and possibly picked up by a publication or online news or industry source. The subjects for news stories or features are pitched to media contacts which would include email, mail and possibly phone follow up. Potentially a visit by a journalist to your site would be scheduled with an interview. A feature story would probably include a photo session and submitting resource information whether specs, logos or other graphics. Could end up as a nice story about your company, or at least being a part of a larger story the journalist publishes. No invoice comes at the end of the month (except mine if I helped you with the news release and media pitch and the distribution service cost). Additionally, how much soft cost was spent on the project? From your time talking to the media to taking photos to staff cleaning up before the media visit? I’d like to know your company a little better than a ten-minute phone call before placing an ad. I could do it that quickly though, and it probably would be marginally successful. Also, I’m not saying PR is bad. PR and Social Media can be a very productive part of the marketing tactic mix. This discussion is just about cost. PR costs plenty. Social Media costs some budget/money (developing content, graphics, video, etc. ), but it is a substantial cost in time, energy and expertise. Read more about budgeting in Genius! Marketing. Buy Genius! Marketing book now! Watch the video “How Much Marketing?” about marketing budget. Contact us to help you with your marketing budget or ask us your marketing question.